What are Open BIM and Closed (proprietary) BIM? If you are looking at this article you are probably already familiar with what BIM (Building Information Modelling) actually is. And if not, check out this article. What BIM is – and what it isn’t. 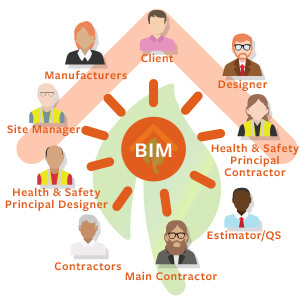 The true benefit of BIM is the cost saving that can be achieved through the exchange of data across different stakeholders from design, to estimate of costs, schedules and timescales, energy performance, health and safety to facilities management post completion. A disadvantage that building project faces is not all participants use the same BIM application. Making data exchange almost impossible. Open BIM saved the day by resolving this issue. Open BIM means that the application uses non-proprietary, neutral file formats. Easier access for importing/exporting of data between BIM software programs. Closed BIM on the other hand is where the same BIM software from one BIM vendor is used by all in the project team including different disciplines such as the designer to draft the plans and 3D model, the estimator to price up the project and undertake the Bill of Quantities, the project manager to develop and manage the build program and the health and safety coordinator to produce the necessary documentation and implement in a timely fashion. At Integro Construction Software we always ask what type of building company is implementing BIM within their business. Open BIM will be very crucial for AEC firms who work on large projects such as shopping centres and airports. It will include different stakeholders from different firms, using different BIM applications. They would need to choose software solutions that successfully “talk to each other”= “interoperability”. On the other hand, a housing developer or home extension company may well have the project team in-house. Engaging with designers, an estimator, a project manager, site manager and so on directly.Therefore implementing one company wide application such as BuildingWorks, with one easy to use interface (meaning different systems are not necessary to train on) might be a better way forward both in terms of cost and speed of implementation. Previous indication shows for disparate BIM applications from different software companies to “talk to each other” Open BIM protocols has developed called Industry Foundation Classes (IFC) and Construction Operations Building Information Exchange (COBie). Although a great idea in practice, the inter-operability problems which arise can be very challenging. For example data losses or elements of models not appearing correctly between BIM software, which introduces risk. To begin with, its crucial to gather and assign drawing objects for the rates data. For domestic building work is often disproportionate in cost and complexity of the project. This is why the Closed BIM approach is often preferred by firms as it reduces or in the case of BuildingWorks completely removes the problems of interoperability when different project stakeholders are using different applications. To begin with, its crucial to gather and assign drawing objects for the rates data. With BuildingWorks project data can be easily shared across multidisciplinary teams – even if the team is just one supercharged person doing everything. Each stakeholder has their own licence of BuildingWorks and can share the files they are working on with colleagues. There is no file conversion or importing/exporting required as it has one common interface. Thus, the subscriber can choose from a range of wholly integrated modules. Simply 100% compatibility. BuildingWorks offers 7D BIM. 2D plan, 3D model, 4D time, 5D cost, 6D sustainability*, 7D health & safety* and provides a new way of working. 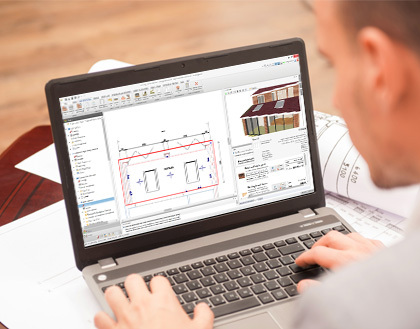 As the user draws plans using simple CAD tools, the estimate and build program builds live on screen. It simultaneously demonstrates to the users certain features: the material costs, labor involved, rates, building time, energy performance and more. The software comes pre-populated with thousands of building rates linked to rich product data and on everyday building materials. Mainstream UK suppliers gained the opportunity to apply them on their projects, saving them set up time. Whilst also reducing time on the mapping of rates to drawing objects and elements. In other words, a 3D model, a full Bill of Quantities (New Rules of Measurement) and detailed costings scheduled with REAL products all from the drafting of the plan. *The launches on the software throughout 2017 will include improvements such as, extend to advanced project management. As well as, health and safety integrated within the BIM model. between participants on the same project, using the application with no degradation of data quality. There is a seamless, interrupted flow of rich project information from building model with instant views of specification, cost, Bill of Quantities, JIT schedules, Gantt chart and project phasing. The “Shareable” pack & go files mean BuildingWorks files can be sent to colleagues for review and amends throughout the evolution of the project if they subscribe to BuildingWorks. BuildingWorks files can also be saved to the cloud including Dropbox, Microsoft One Drive and Google Drive, so team members can access BuildingWorks files from anywhere and collaborate on them e.g. 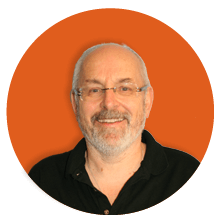 to review the plan and the specification, or to enter subcontract or supplier quotes…or for the site manager to review the Gantt chart…or for the health and safety officer to see what stage the build program is at and the documents required. Plus of course there are lots export options from BuildingWorks. For example, estimate data and BoQ to PDF / XLS /XLSX / CSV / RTF (Word) / HTML / MHT / TXT / Image (BMP/JPEG) / XPS, same with plans (DWG/DXF/PDF/JPEGS) and the build program which can be saved to a MS Project file. This is a practical exchange of project information…and even better, if you’re really “on it”, all parties can have a copy of BuildingWorks to view and make amends – this is proprietary or closed BIM at its best. Give us a call on 0117 916 7880. Tell us about your building firm and we’ll talk you through how BuildingWorks BIM software can improve your building projects through collaboration and coordination.